Six Wheel-thrown Ceramic Vessel sherds dating to the Roman period comprising of: 3 Reduced Greyware coarseware sherds (one base sherd and two body sherds). The fabric has large and frequent inclusions of grog, moderate crushed flint and the base sherd has large voids indicating loss of organic tempering. The sherds range from light to mid grey exteriors with the core ranging from light grey to red-grey. 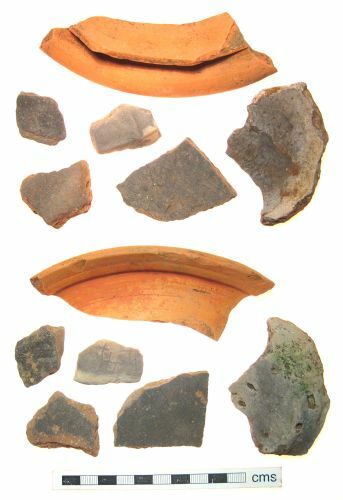 These sherds are most probably from storage of cooking containers but the items are not clearly diagnostic(Ref: R90 in the Oxford Archaeology Roman Pottery Recording System). Total Weight: 72.13g 1 body sherd of Medium-Fine greyware with minimal small inclusions of sand and flint. The fabric has a dark grey exterior and a mid grey core. This sherd is most probably from storage container but the sherd is not clearly diagnostic. (Ref: R30 in the Oxford Archaeology Roman Pottery Recording System). Weight: 23.86g 1 worn upright rim sherd of fine greyware with no notable inclusions apart from being moderately micaceous. The fabric has a mid grey exterior and a lighter grey core. There are faint traces of a cross-hatching design on the external surface. This sherd is not clearly diagnostic as to its form but could plausibly be part of a jar. (Ref: R10 in the Oxford Archaeology Roman Pottery Recording System). Weight: 9.3g 1 body sherd from an Oxfordshire colour-coated vessel. The sherd has a broad flanged lip along the outside edge (Ref: Young C51). The fabric has traces of a red slip, the exterior is mid red-orange and the core is mid grey in colour. There are no notable inclusions although the fabric is again moderately micaceous. The item will once have formed part of a decorative tableware bowl. (Ref: F51 in the Oxford Archaeology Roman Pottery Recording System). Weight: 68.75g All six sherds have been dated to the period AD c.240-400.